Camel Pose, or Ustrasana, is a moderate backbend asana that yogis can learn in stages. Ustrasana is from the Sanskrit word ustra, meaning "camel." This kneeling backbend slightly resembles a camel. Inhale and rise out of Hero pose, back straight, buttocks firm, legs hip-width apart. Press the tops of the feet and the shins down into the floor. Place your palms on the top of your buttocks at the tailbone, fingers pointing down, and ease your pelvis forward. Inhale and then, on an exhale, move the body backward as the hands inch toward the feet. Keep the chin pointing upward, torso stretched. Ease the body more into the bend as is comfortable without straining. Arms should be rotated outward, elbows behind you. Hold the pose for 30 seconds, breathing deep. Slowly come out of the pose by drawing the body forward in a fluid motion, hands to the tailbone and then on the hips, and release into Child's pose. For more instruction on Camel Pose, visit Yoga Journal. Rely on yoga equipment such as blocks and bolsters to avoid injury and learn good form. Ease back gradually as your flexibility increases. Use a folded blanket under the knees or shins for more comfort. 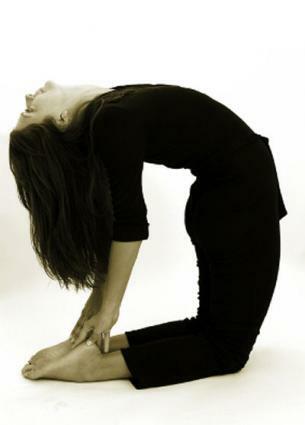 Practice backbends gradually, obeying your body's signals as to how far it can go each time. Deepen the arc by bringing your feet, calves, and inner thighs together.